Hanoi (VNA) – Several provinces held ceremonies on August 31 to honour local athletes who made outstanding performance when competing at the recently-concluded 29th Southeast Asia (SEA) Games in Malaysia. The central province of Thua Thien-Hue heaped praise on runner Tran Thi Yen Hoa and karate artist Le Minh Thuan. Yen Hoa brought home a gold medal in the women’s 4x100m relay and another in women’s 100m hurdle race. Minh Thuan and his team earn the gold medal in the men’s kumite team event. The northern province of Ninh Binh presented certificates of merit and cash gifts to its seven athletes who joined the national team at SEA Games 29. Among the Ninh Binh athletes, Vu Thi Ly earned a gold medal in the women’s 800m race and a silver in the women’s 1,500m. Three karate artists – Giang Viet Anh, Giang Thanh Huy and Nguyen Anh Dung – helped Vietnam get the bronze medal in the men’s team kata event. Meanwhile, Giang Van Duc and Nguyen Xuan Thanh are members of the men’s volley ball team which came home with a bronze medal. Vietnam won a total of 58 gold, 50 silver and 60 bronze medals to stay at the third place in overall rankings of the 29th Southeast Asian (SEA) Games, which concluded on August 30. 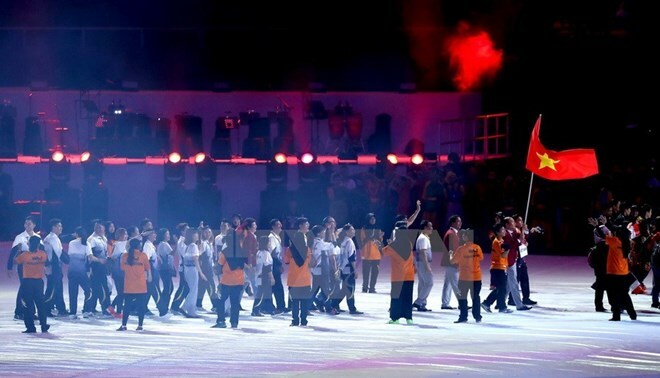 The country sent 472 athletes to SEA Games 29, competing in 32 out of 38 sports at the event.